The WW has been AWOL for a while, but a worthy selection came from the depths of my cellar to take the challenge. 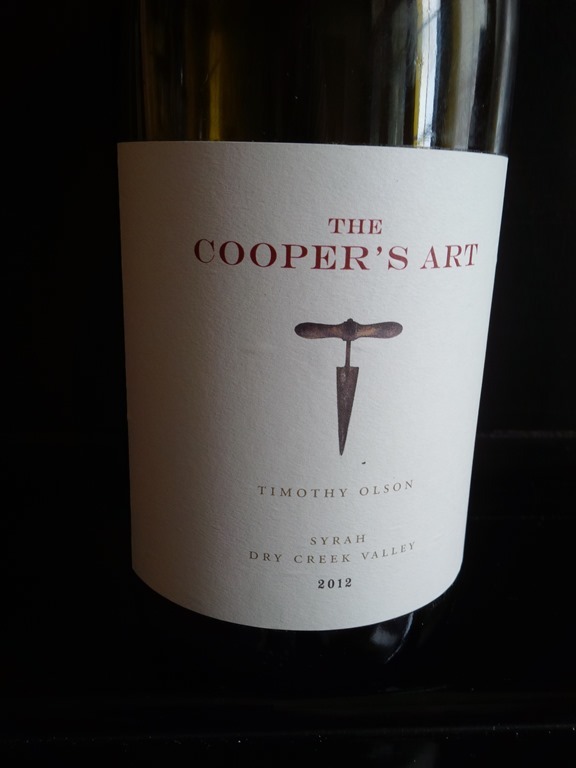 Tim Olson’s “The Cooper’s Art” Sarah – Dry Creek Valley, 2012. When I bought this wine I thought it was fabulous, but I loved it’s potential more than I loved the wine at the time. Tim makes wine in a classic style and they require age to show their true colors. This wine was no exception and it has really grown up since I cellared it in 2013. A rather uncharacteristic Sarah, it presents with great Sarah nose and palate, but has the body of a big Bordeaux or a well aged Cab. Tim makes wine in small batches and accordingly his fans snap them up as soon as they release to the market. They (all except his whites) require patience to fully appreciate them, If you drink them young, you must decant them for at least two hours. When I first bought this wine I thought it so tight, that I actually left a remaining half bottle open overnight and the next day to see what would happen. The result – a much more open and pleasing wine loaded with potential for development with aging. I have a detailed review of this wine the year I bought it (unfortunately I act access it at the moment but I’ll try to find it and add it later) and I just did another. You can check the current one out in the wine reviews section of Poor Robert’s. I sadly will note that Tim’s 2014 vintage is already sold out, but be patient, he will have another gem next year. Be sure to get it early and get a supply or you will be left at the Altar as many found themselves this year. This entry was posted in Craft Wines, Sarah, Tim Olsen, Wine, Wine Making, Winemakers, Wines and tagged Finding_Our_Features, Red Wine, Sarah, Tim Olson, Wine, Wine Making, Wine Varieties. Bookmark the permalink. Cab. Bordeaux. Your description makes me want to sample this.